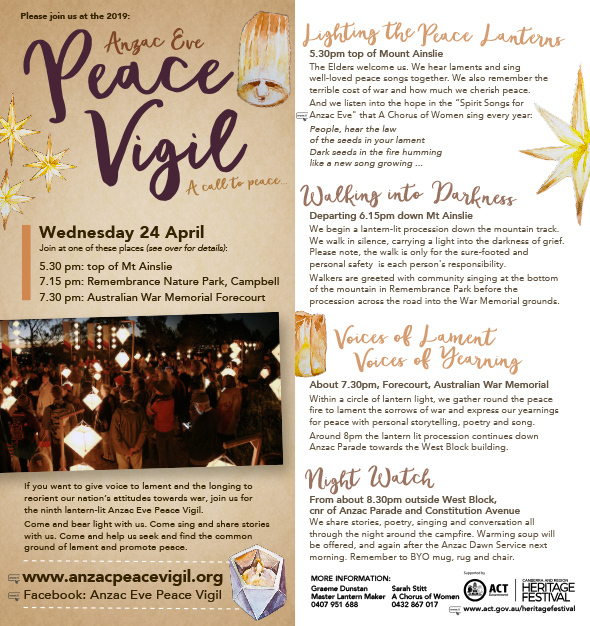 The ninth annual Anzac eve Peace Vigil will remember victims of all wars in one of the city 's most loved ceremonial events. "We aim to draw forth lament in order to move beyond the destruction and trauma of war towards cultural renewal," said lantern master and long time peace activist, Graeme Dunstan. "The Vigil is truly a beautiful event, a luminous gem among the many luminous festivals and events in Canberra," he said. Since last year the Vigil has been recognised and included as part of the program of the annual ACT ACT Heritage Festival. Aboriginal elders lead the Mt Ainslie ceremony, which includes community singing and songs by Canberra's A Chorus of Women,. Participants then proceed in silence down the mountain track, carrying lantern light and guided to experience it as a journey into the darkness of grief. "Before entering the Australian War Memorial precinct participants will pause to gather in singing together peace songs that we know so well." "In the forecourt of the Memorial, which is set up for the Dawn Service, participants form a lantern lit circle and find voice to say our grief, our fear of war and our yearning for peace." Mr Dunstan said the event was created as a collaboration between A Chorus of Women and himself in 2011 as a creative expression of peace and our concern about the militarisation of our history and culture. "We wanted to create artful liturgies for establishing lament as a common ground for building peace and community," he said. "I am pleased to say that Dr Brendan Nelson AO, director of the Australian War Memorial has been a friend to our efforts since he first took office. From the first Dr Nelson has asserted that in foundation, the War Memorial is a memorial to peace." "While we are grateful for Dr Nelson's goodwill, we Vigil organisers differ in opinion about the benefits that Anzac Day liturgies bring to the promotion of peace," said Mr Dunstan. 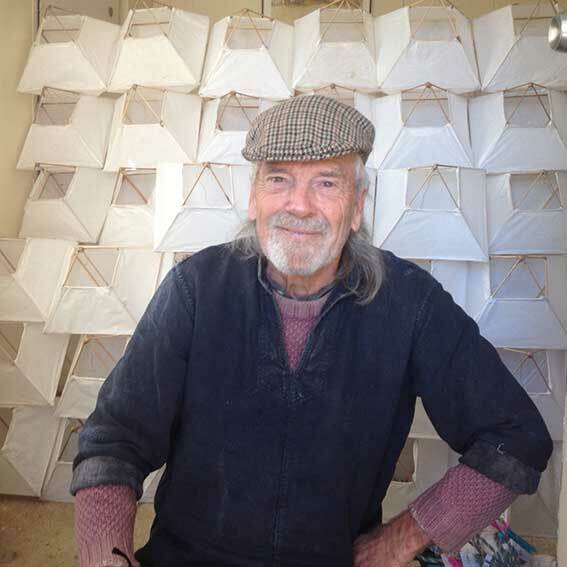 Here is Graeme the Lantern Master with his lantern stash - 280 of them - all reapired and ready to go for the upcoming Anzac eve Peace Vigil. The lanterns are stored at the Silver Wattle Quaker Centre near Bungendore. Gratitude to the Friends. Without their support there would be no lantern lit 'journey into grief" down the bush track from the top of Mount Ainslie to the Australian War Memorial on Anzac eve.